It's been immortalized in books (Silent Night: The Story of the World War I Christmas Truce by Stanley Weintraub and Truce by Jim Murphy), movies (The Christmas Truce and Joyeux Noël), songs ("Belleau Wood" by Garth Brooks) and even by cartoon characters (Snoopy vs the Red Barron or Merry Snoopy's Christmas by the Royal Guardsmen). But what really happened? And was it as prevalent as the myth that surrounds it leads us to believe? December 1914 alternated between freezing cold and miserable wetness. Seems logical soldiers who thought the war would be won and they'd be home in their own beds by Christmas 1914 would want a little comfort for the season. 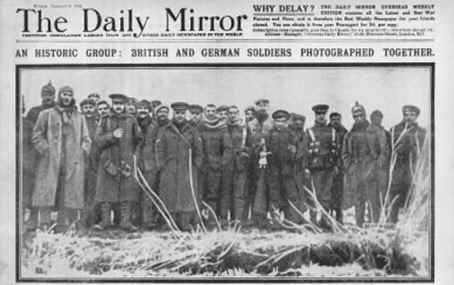 It's important to note that this truce happened between the German and British troops, not so much with the Belgium (Flanders) and French troops, whose countries were occupied and who probably weren't in a holiday mood. Plus Germany and Britain were closer culture-wise, language-wise, and monarchy-wise. While I don't know if that had anything to do with the truce, it's worth mentioning. Along the front the enemy was sometimes no more than 70, 50 or even 30 yards away. Both Tommy and Fritz could quite easily hurl greetings and insults to one another, and, importantly, come to tacit agreements not to fire. Incidents of temporary truces and outright fraternisation were more common at this stage in the war than many people today realise--even units that had just taken part in a series of futile and costly assaults, were still willing to talk and come to arrangements with their opponents. [A] message asking for a ceasefire later that evening so they could celebrate the festive season and their Captain's birthday. They proposed a concert at 7.30pm when candles, the British were told, would be placed on the parapets of their trenches. The British accepted the invitation and offered some tobacco as a return present. That evening, at the stated time, German heads suddenly popped up and started to sing. Each number ended with a round of applause from both sides. The Germans then asked the British to join in. At this point, one very mean-spirited Tommy shouted: 'We'd rather die than sing German.' To which a German joked aloud: 'It would kill us if you did'. Along many parts of the line the Truce was spurred on with the arrival in the German trenches of miniature Christmas trees--Tannenbaum. The sight these small pines, decorated with candles and strung along the German parapets, captured the Tommies' imagination, as well as the men of the Indian corps who were reminded of the sacred Hindu festival of light. It was the perfect excuse for the opponents to start shouting to one another, to start singing and, in some areas, to pluck up the courage to meet one another in no-man's land. Of course, the British high command didn't like it, but they were in a luxurious chateaux, some 27 miles behind the front. Typical. German high command didn't like it, either, but the trench officers had the same attitude as British trench officers, with the result that those who protested are now considered idiots and those who didn't 'one of the soldiers'. Was it tradition? Yes. It was tradition to celebrate Christmas no matter where they were. They celebrated with the enemy and it evolved into a beautiful story about a horrific war that stands today.